If you’ve recently been in a car accident or other traumatic incident, you may be have experienced a whiplash injury. When the head is thrown backwards and forwards in a violent manner, it can injury the neck and spine. Subsequent pain may radiate all the way through the upper back and shoulders. Here’s what you should know about this condition. Whiplash refers to an injury to the cervical, or neck, region of the spine. The cervical region of the spine is made up of seven backbones, or vertebrae. In whiplash, the neck is thrown to and fro by great forces. These cause it to go well beyond its normal range of motion. Another name for this conditions is neck strain. If you suffer from an injury in the cervical spine, it’s important to know that sometimes your symptoms come on gradually. Many people after a car accident will experience pain immediately. For some, though, those symptoms may take hours or even days to appear. That’s why it’s crucial you talk to a doctor immediately following a traumatic incident. They can check for injuries and help you avoid worsening symptoms. Whiplash is often an enigma. The severity of symptoms do not always correspond to the force of initial accident. Sometimes symptoms can appear after a lengthy period of time. It’s also complicated more by its role in insurance and workers compensation claims. Some feel that our poor understanding of the condition allows people to fleece the system for financial gain. Since pain is so subjective, the veracity of the pain being felt and reported by victims oftentimes comes into question. Nonetheless, despite its stigma, whiplash is a legitimate condition with legitimate symptoms. Many people are curious about how long this condition lasts, as well. We talk about this subject in more detail here. A sudden, forceful jolt can cause the cervical spine to move outside of its normal range of motion. The most common cause of this condition is motor vehicle collisions in which one automobile rear-ends another. The rear impact wrenches the neck forward and then backward. A doctor diagnoses this condition with imaging studies, such as computed tomography (CT) or magnetic resonance imaging (MRI). They’ll also ask questions about the initial incident, and take a full health history to get an idea of your own risk factors and symptoms. Soft tissues of the neck such as ligaments, discs, tendons, nerves, and muscles are not visible using conventional X-ray techniques. In the majority of cases, symptoms are short-lived and resolve quickly. For some, it is complicated by chronic pain in the cervical spine that leads to months or years of pain. To avoid chronic pain from a whiplash injury, it’s important that you talk to a doctor as soon as possible after an incident. They’ll be able to diagnose the severity of your injuries and suggest treatments to avoid future worsening of symptoms. Treatments do vary, depending on the severity of your injury. No singular treatment has been scientifically proven to be superior. Rest and immobilization with a cervical collar were once routinely recommended for this condition. Today, the current trend is toward early movement with gentle physical therapy exercises as opposed to immobilization, which can prolong recovery. At the outset of injury, pain control is of key importance. Your doctor may recommend icing the area for the initial 24 hours after your injury. After that, ice can be replaced by heat. Both should be applied no greater than 20 minutes. Non-steroidal anti-inflammatory drugs (NSAIDs) such as Advil (ibuprofen), Bayer (aspirin), or Aleve (naproxen sodium) can help with mild and some moderate neck pain. If you’re experiencing muscle spasms, muscle relaxants can also help. If you are using medication to manage pain, you should so only as long as recommended by your doctor. Medications should be used for as short a term as possible due to the increased risk of negative side effects with prolonged use. To fully heal from an injury, you have to work at restoring your full range of motion in the neck. You’ll first work in a clinic with an occupational or physical therapist. They’ll guide you through a therapy plan that restores your range of motion and strength. From there, they’ll often give you at-home exercises you can do as well to encourage a faster recovery. It is paramount that you re-establish your range of motion soon after an injury to decrease the chances of chronic neck pain and disability. You should work closely with your doctor if you’re experiencing more serious symptoms. If medication, rest, and a physical therapy program don’t help, they may recommend complementary treatments. These can help relieve pain and other symptoms, but do not typically fix any underlying damage. That being said, they are an incredibly useful tool in a comprehensive pain management approach. Acupuncture is a key component of traditional Chinese medicine and utilizes thin needles placed at strategic points on the body. 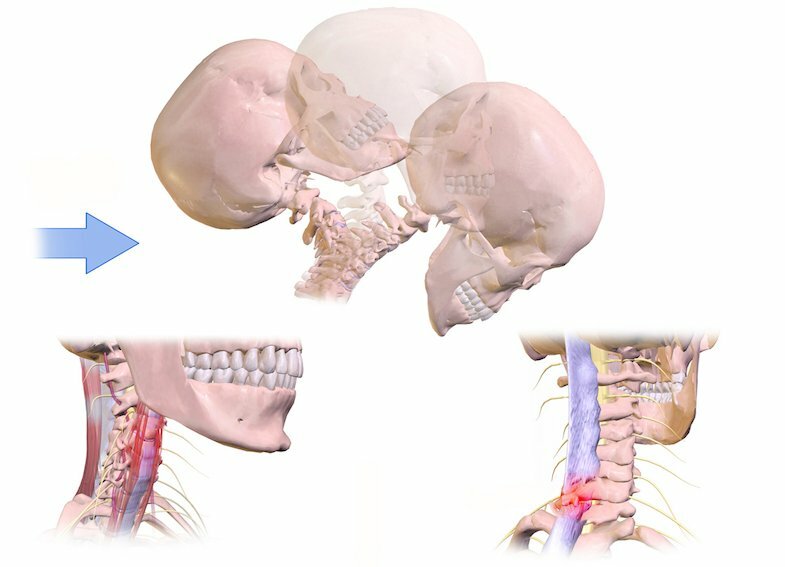 There are a multitude of massage techniques, but acupressure may be the best for neck pain as a result of whiplash. Cervical spinal manipulation or mobilization are two general approaches used by chiropractors for neck pain. Cervical spinal manipulation is the traditional chiropractic technique, while cervical spinal mobilization is a gentler, less forceful technique. Electronic nerve stimulation utilizes a gentle electric current, which can help reduce neck pain. Unfortunately, this condition can lead to chronic neck pain. If this occurs, there are interventional treatments that can help. Neck injections with steroids or anesthetics may be helpful. You can learn more about those steroid injections here. Another option is radiofrequency ablation. This technique utilizes radio waves to generate heat to destroy nerves that are sending pain signals to the brain. The following video shows you what you can expect during a radiofrequency ablation procedure. If chronic headaches occur after an injury, Botox (botulinum toxin A) injections can also be helpful. Your symptoms may manifest over the course of hours or several days. Pain is usually temporary and treatment is conservative. For those who suffer from chronic neck pain as a result, invasive treatments such as steroid injections or radiofrequency ablation may provide some relief. If you’re suffering from pain or immobility from a previous injury, there is help. You can find a pain specialist in your area by clicking the button below or looking for one in your area by using the tips here: https://paindoctor.com/pain-management-doctors/. Eichenberger U, Greher M, Kapral S, et al. Sonographic visualization and ultrasound-guided block of the third occipital nerve: prospective for a new method to diagnose C2-C3 zygapophysial joint pain. 2006;104(2):303-308. Becker WJ. Cervicogenic headache: evidence that the neck is a pain generator. 2010;50(4):699-705.